Streamline project management efforts with real-time collaboration. A cost benefit analysis weighs the pros and cons, or benefits and costs, of a project or decision in order to determine its feasibility or to compare alternatives. This can be especially helpful for weighing decisions that have calculable financial risks and rewards, or when you need a quick way to evaluate a new initiative. In addition to comparing multiple projects or deciding whether a project is a sound investment, a cost benefit analysis can provide valuable information when it comes time to actually implement a project. Understanding a project’s costs and benefits can help determine appropriate objectives, accurately estimate the needed resources (and associated costs), and inform your methods for measuring project success. Cost benefit analysis has enjoyed a long history. First created in the 1840s by French economist and engineer Jules Dupuit, it was widely used to measure the value of different projects (especially government projects related to public policy and infrastructure). Today, a cost benefit analysis is suitable for any business setting, but the method is not without flaws. The more tangible the costs and benefits, the more likely it will be to get an accurate analysis. It may be easier to assign monetary values to costs than benefits since revenues can be hard to predict, and intangible benefits - such as increased customer satisfaction or an enhanced business reputation - may have subjective values. An analysis could also be influenced by project supporters who may be looking for data that will back up taking on a project. While using a cost benefit analysis can be a useful tool in determining the feasibility of a project, creating one can be a bit overwhelming. 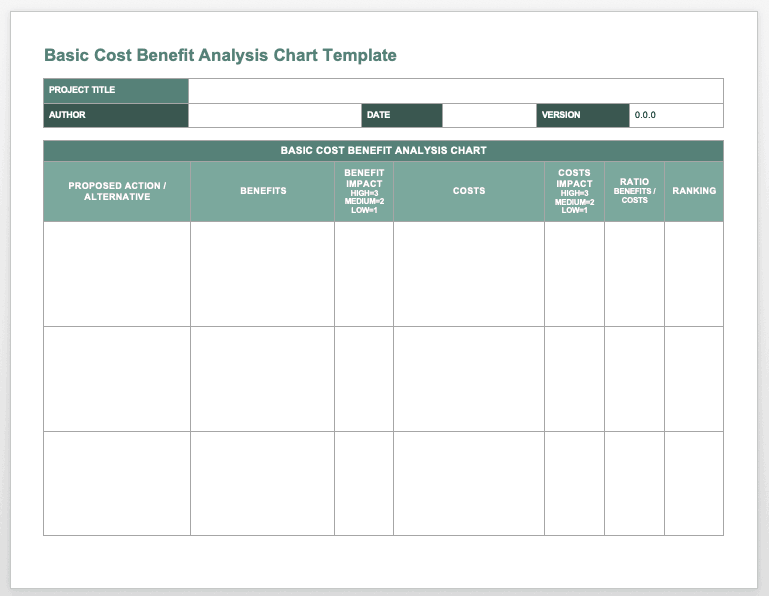 To get you started, we’re providing a collection of cost benefit analysis templates in the Microsoft Word and Excel formats that you can download for free. We’ve also included customizable cost benefit analysis templates in Smartsheet, a real-time work execution platform that empowers you to better plan, track, and report on project details. Depending on the length and type of project, a cost benefit analysis may also need to account for costs and revenues that occur over periods of time and take into consideration how monetary values change over time. This can be done by calculating the Net Present Value (NPV), which measures a project’s profitability by comparing the present outgoing cash flows to the present value of future cash inflows. In other words, once the monetary values for all costs and benefits for a project have been determined, a discount rate can be applied in order to convert future cash flow estimates to today’s value. Calculating NPV as part of a cost benefit analysis can help account for inflation and lost return on investment (the amount of money spent on a project that could have been invested elsewhere). There are three primary steps involved in performing a cost benefit analysis: identifying costs, identifying benefits, and comparing both. Here’s a closer look at each stage of the process. Identifying Costs - Begin by brainstorming all potential costs, which may include equipment, payroll, training, travel costs, licenses, and other monetary expenses. You should also consider non-monetary costs such as those related to productivity or risks and uncertainties that could affect project outcomes or your business. Ultimately, all costs need to be assigned a monetary value in order to complete the cost benefit analysis. Your project may require one-time costs related to investment or operational expenses as well as recurring costs over the project lifecycle and beyond. All monetary values for costs occurring over time should be calculated in present value terms in order to create estimates that are as accurate as possible. You may also want to consider what the costs may be if you choose not to undertake the project or if the project fails. Identifying Benefits - As stated earlier, it can be hard to determine accurate revenue projections, and certain intangible benefits may not have clear monetary values, so this step can be more challenging than identifying and monetizing costs. Benefits can range from direct profits and increased production to enhanced employee satisfaction or reduced environmental impact. As with costs, the values assigned to benefits also need to be shown in present value terms for a more accurate analysis. Comparing Costs and Benefits - Once you have listed all the costs and benefits, you can compare the totals to see if the costs outweigh the benefits or vice versa. If the two totals are equal or very close, you may need to check your calculations, make sure no costs or benefits have been overlooked, and conduct a revised analysis. As you compare costs and benefits, consider how long it will take for the benefits to repay the costs. In addition to considering the difference between total cash flows, this timeframe may also inform your decision of whether a project is a sound investment, or not worth the time and resources. Once you have completed your analysis, you can use the information to make a recommendation to either move forward with a project or choose an alternative, and create a plan of action that will support business objectives. In the next section you’ll find cost benefit analysis templates in Microsoft Excel and Word formats that can be downloaded for free. 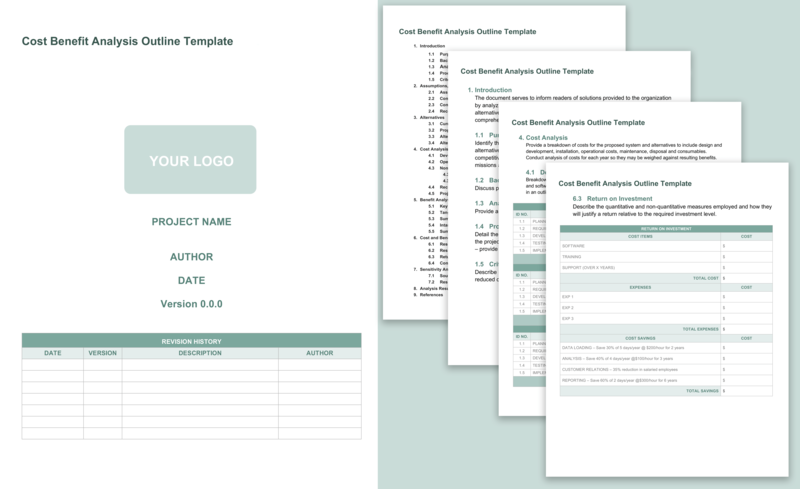 These templates provide a starting point for developing your analysis and can be edited as needed. Smartsheet also offers a cost benefit analysis template with enhanced collaboration features and additional benefits, or you can create your own template to fit your needs. 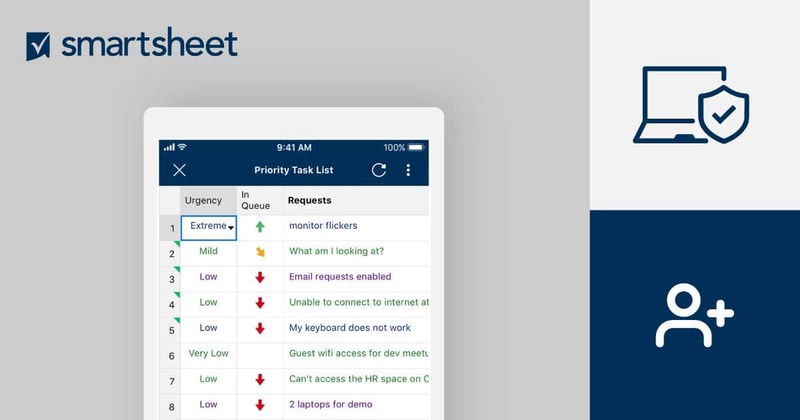 Find out more about Smartsheet options below. 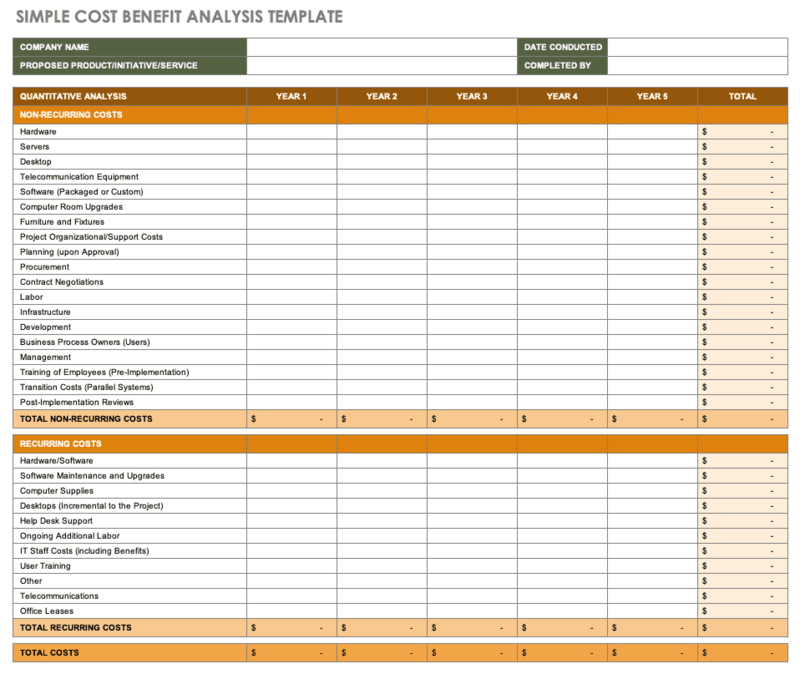 This cost benefit analysis template provides a simple spreadsheet for listing and calculating recurring and nonrecurring costs, plus revenues and other benefits. The template will calculate totals per year and over the course of five years. For a quick comparison, the second sheet in the template shows total amounts for each type of cost and benefit listed in the first sheet. 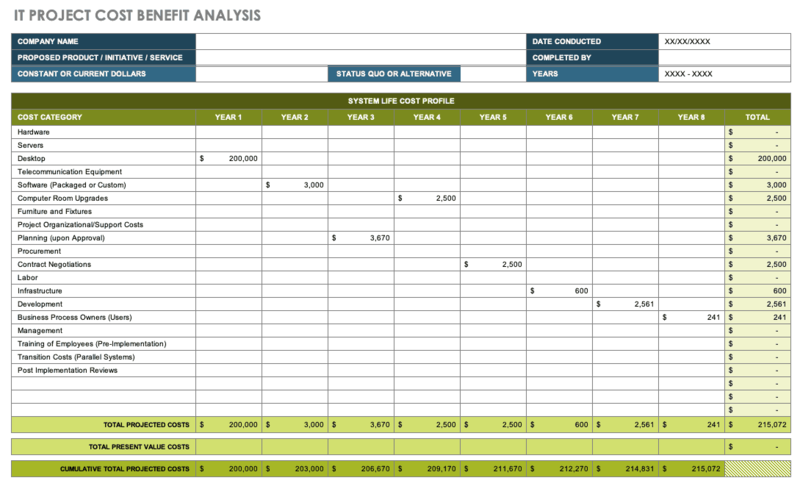 This project cost benefit analysis template was designed with IT in mind, and includes sheets for creating comprehensive lists of costs and benefits over several years, analyzing projected cash flows, and comparing alternatives. Create a detailed cost benefit analysis that takes the entire project lifecycle into consideration to guide your decision and project-planning process. You can modify the template to suit the needs of your particular analysis. 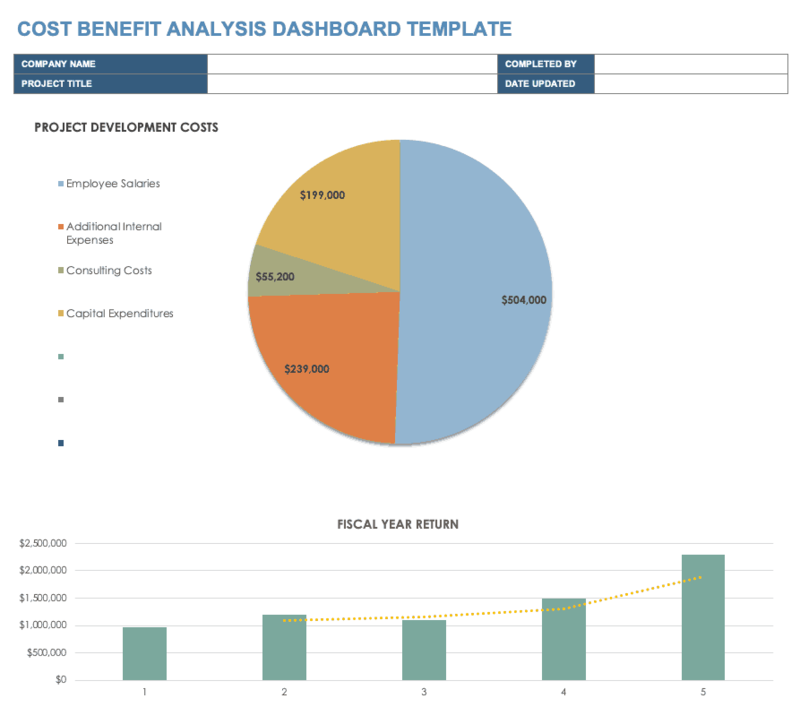 Get an easy-to-read dashboard view of your cost benefit analysis with this visual report. Data is represented in a spreadsheet format as well as graphically, which is especially useful if you’re using the cost benefit analysis as part of a presentation. You can use this template to list costs and benefits over time and help determine the net present value (NPV) of a project. This chart can be used to rank costs and benefits of potential actions. List actions or decisions you are considering in the first column, and then describe the costs and benefits associated with each. Assign a rank to each option based on the total costs and benefits listed, and then compare those ranks to see to what degree the benefits outweigh the costs. This is a simple way of comparing and prioritizing options. Determining the costs and benefits related to your project or organization is important to creating and implementing a successful plan of action. Once you’ve completed your cost benefit analysis, it’s essential that you have the right tools in place to plan, track, automate, and report on the project details from start to finish.